DAPCU Dimapur (Nagaland) conducts monthly review meeting of all the NACP facilities on 3rd of every month where all the reports are brought by the concern staffs of NACP facilities to review and submit the reports. DAPCU team ensures that all the facilities submit the monthly report in time before entering the data’s in SIMS. During the meeting, preceding months analysis are highlighted where DAPCU team highlights the gaps and achievement of the NACP facilities and in which areas focus should be made to achieve the targets. During the meeting the NACP facilities submits their hard and soft copy of reports, the DAPCU team cross checks the for reporting errors. The ICTCs do not enter the data online in SIMS due to non availability of internet facilities/data card in their respective center's and for which the facilities submits the soft copy to DAPCU. DAPCU teams make sure that all data are being captured and entered in soft copy and after proper cross checking the DAPCU team enters and upload the data in SIMS and then forwards it to SACS. DAPCU staff have also developed the SIMS information details in Excel format where the team enters all the details of hard copies submitted by the facilities where it has become easier for DAPCU to extract the data and records of all the ICTCs and through that format DAPCU does the analysis and highlights to the facilities during the month review meeting and also during the DAPCU review meetings. 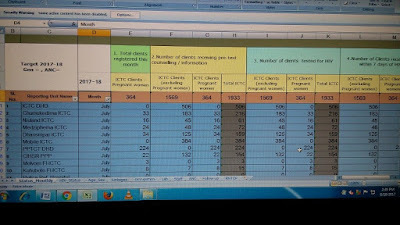 Many a times the DAPCU team has observed while cross-checking and reporting the discrepancies in referral and linkages from TIs to ICTCs in regard to HRGs testing the data reported by the facilities does not tally with the TI Reports. 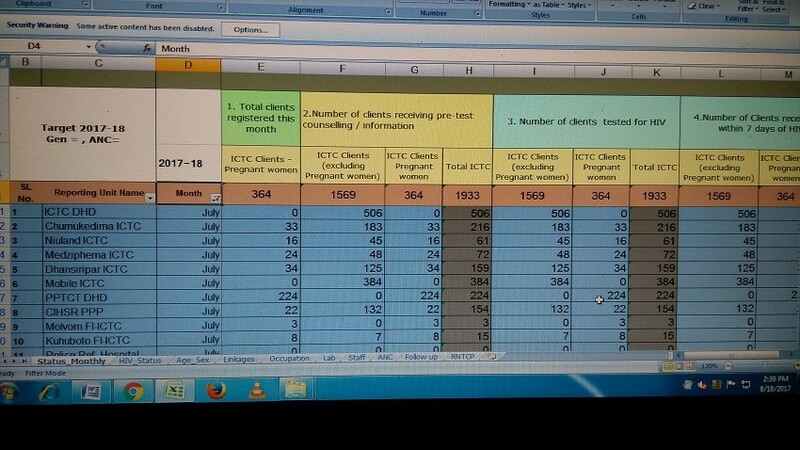 So inorder to have quality, accurate and standard reporting from all the facilities, DAPCU have developed another format in excel sheet to validate Targeted Intervention (TI) to ICTCs referral. DAPCU developed format to validate TI to ICTC referrals. 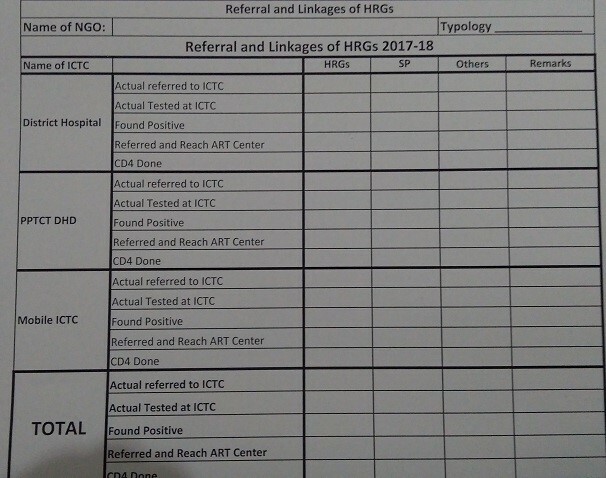 The above format have been sent to all the 11 (eleven) TI NGOs in Dimapur district where the TI NGOs reports every month about the HRGs being tested in different facilities. 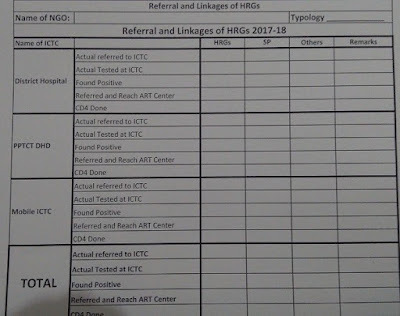 Through that format DAPCU teams can easily identify the referral of TI HRGs tested in different ICTCs and can find out how many HRGs were tested in ICTCs and the same report is being cross checked with the ICTCs report while submitting their monthly report. The same format is being used by DAPCU while going for supervisory visit to ICTCs and TI NGOs in order to cross check with their reports and records. Another format developed by DAPCU teams is the TI to ICTC comparison mainly to track the HIV positive detected from the TI NGOs. Through this format DAPCU can identify the numbers of HIV positive detected in TI NGOs. Through all these formats and records maintained by DAPCU, the team can easily identify the discrepancies with the concern facilities and rectify the errors and also helps DAPCU to extract the data as and when required for information and this has also reduced the data discrepancies to a large extent in our district which is consider as the highest HIV positive detection in our state Nagaland.